This example shows how to simulate responses from a regression model with ARIMA unconditional disturbances, assuming that the predictors are white noise sequences. where the innovations are Gaussian with variance 1. 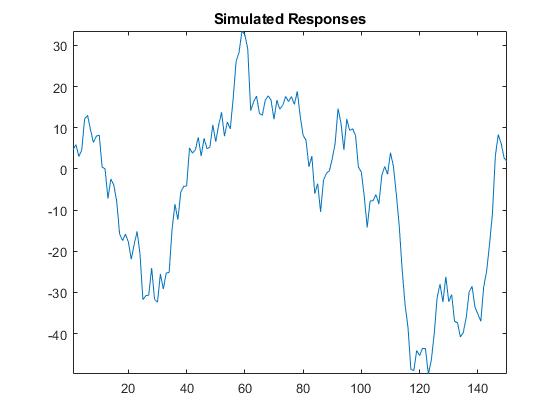 Simulate two Gaussian predictor series with mean 0 and variance 1. 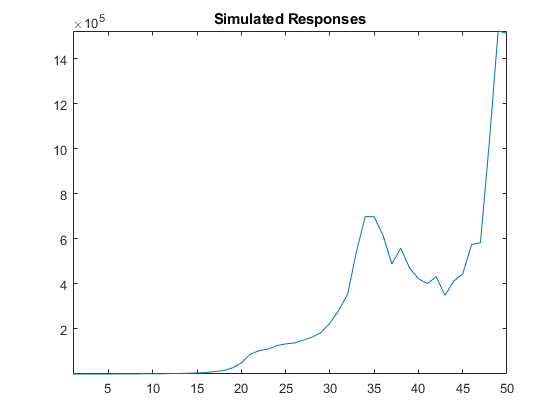 Simulate and plot the response series. Regress y onto X. 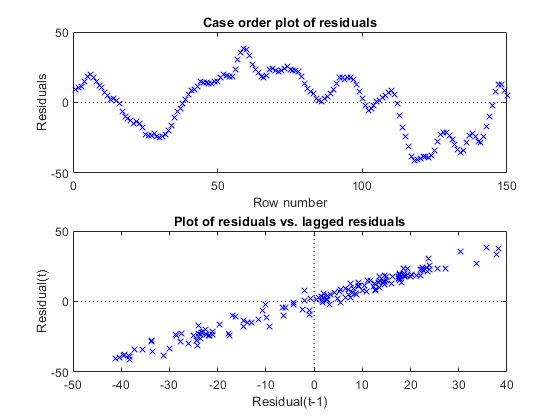 Plot the residuals, and test them for a unit root. The residual plots indicate that they are autocorrelated and possibly nonstationary (as constructed). h = 0 indicates that there is insufficient evidence to suggest that the residual series is not a unit root process. 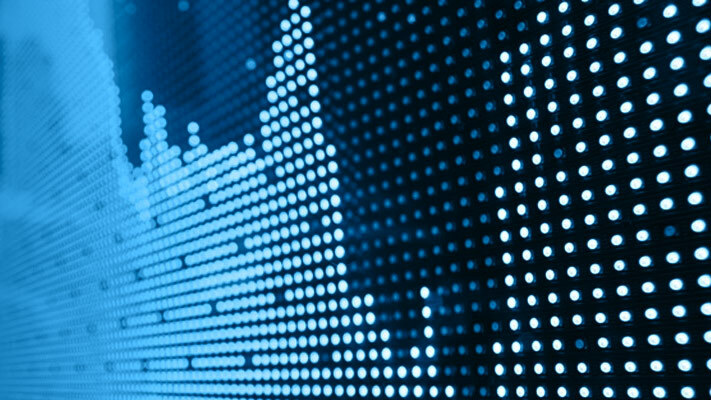 Treat the nonstationary unconditional disturbances by transforming the data appropriately. In this case, difference the responses and predictors. 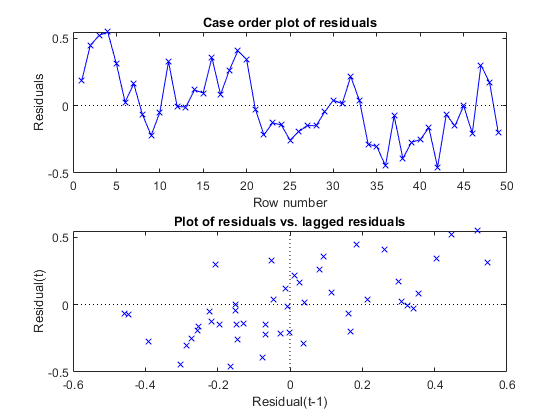 Reestimate the regression model using the transformed responses, and plot the residuals. The residual plots indicate that they are still autocorrelated, but stationary. h = 1 indicates that there is enough evidence to suggest that the residual series is not a unit root process. 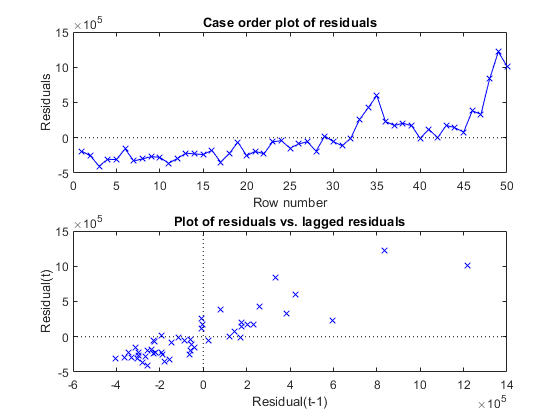 Once the residuals appear stationary, you can determine the appropriate number of lags for the error model using Box and Jenkins methodology. Then, use regARIMA to completely model the regression model with ARIMA errors. This example shows how to simulate responses from a regression model with nonstationary, exponential, unconditional disturbances. Assume that the predictors are white noise sequences. where the innovations are Gaussian with mean 0 and variance 0.05. Simulate unconditional disturbances. Exponentiate the simulated errors. The response series seems to grow exponentially (as constructed). Regress y onto X. Plot the residuals. The residuals seem to grow exponentially, and seem autocorrelated (as constructed). Treat the nonstationary unconditional disturbances by transforming the data appropriately. In this case, take the log of the response series. Difference the logged responses. It is recommended to transform the predictors the same way as the responses to maintain the original interpretation of their relationship. However, do not transform the predictors in this case because they contain negative values. 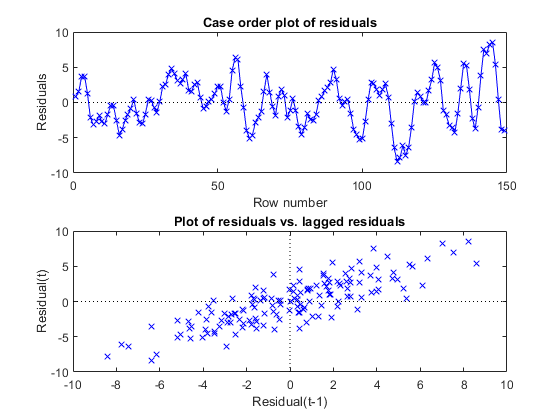 Reestimate the regression model using the transformed responses, and plot the residuals.